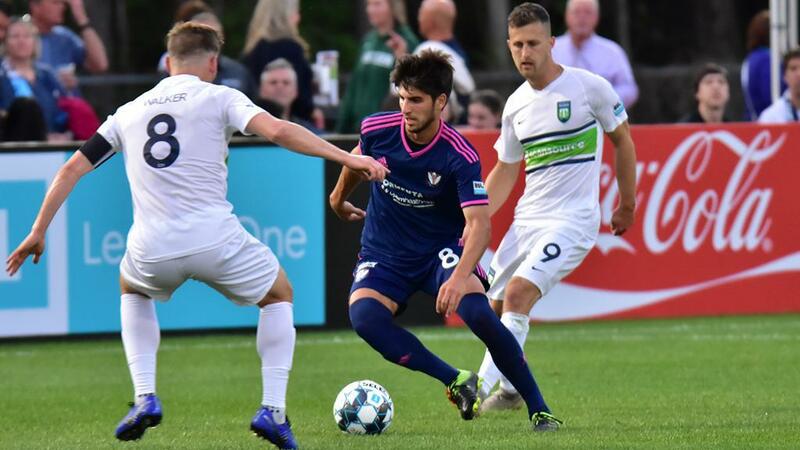 CHICAGO – Greenville Triumph SC and South Georgia Tormenta FC squared off in March for the first game of USL League One’s history. On Wednesday afternoon, the two clubs learned they would meet again this May in arguably the marquee contest of the First Round of the 2019 Lamar Hunt U.S. Open Cup as U.S. Soccer officially announced the opening round matchups for the historic tournament's 106th edition. Greenville will play host to the clash on Wednesday, May 8 at Legacy Early College, with kickoff set for 7 p.m. ET. In addition to Greenville, League One’s Richmond Kickers also received a home draw and will play host to Virginia United at City Stadium on Tuesday, May 7 at 7 p.m. ET. The winner of the historic tournament in 1995, the Kickers also made one of the most memorable runs by a lower-division club this decade when they reached the tournament’s Semifinals in 2011. Lansing Ignite FC will open its first entry to the Open Cup on home turf as well and will play host to AFC Ann Arbor at Cooley Law School Stadium on Wednesday, May 8 at 7 p.m. ET. League One’s other two clubs will head on the road for their first forays into the Open Cup, with Chattanooga Red Wolves SC drawn against South Georgia Tormenta FC 2 of USL League Two on Tuesday, May 7 at 8 p.m. ET. Forward Madison FC, meanwhile, will open its first entry to the tournament against Bavarian SC at Uihlein Soccer Park in Milwaukee, Wisc. on Tuesday, May 7 at 8:30 p.m. ET. The draw for the Open Cup’s Second Round, which will see the introduction of USL Championship clubs to the field, will be made next Wednesday, April 17. FC Baltimore vs. West Chester Predators, 7 p.m. ET, Homewood Field, Baltimore, Md. Richmond Kickers vs. Virginia United, 7 p.m. ET, City Stadium, Richmond, Va.
Lakeland Tropics vs. The Villages SC, 7 p.m. ET, Lake Myrtle Sports Complex, Auburndale, Fla.
New York Cosmos B vs. Black Rock FC, 7:30 p.m. ET, Rocco B. Commisso Soccer Stadium, New York, N.Y.
New York Red Bulls U23 vs. FC Motown, 7:30 p.m. ET, New York Red Bulls Training Facility, East Hanover, N.J.
South Georgia Tormenta FC 2 vs. Chattanooga Red Wolves SC, 8 p.m. ET, Erk Russell Park, Statesboro, Ga.
Bavarian SC vs. Forward Madison FC, 8:30 p.m. ET, Uihlein Soccer Park, Milwaukee, Wisc. Academica SC vs. El Farolito, 10:30 p.m. ET, Academica Field, Turlock, Calif.
Cal FC vs. FC Mulhouse Portland, 10:30 p.m. ET, Calabasas High School, Calabasas, Calif.
Orange County FC vs. FC Golden State Force, 10:30 p.m. ET, Championship Soccer Stadium, Irvine, Calif.
Erie Commodores FC vs. Dayton Dutch Lions, 7 p.m. ET, McConnell Family Stadium, Erie, Pa.
Lansing Ignite FC vs. AFC Ann Arbor, 7 p.m. ET, Cooley Law School Stadium, Lansing, Mich.
Reading United AC vs. Philadelphia Lone Star FC, 7 p.m. ET, Alvernia University Stadium, Reading, Pa.
Greenville Triumph SC vs. South Georgia Tormenta FC, 7 p.m. ET, Legacy Early College, Greenville, S.C.
Miami FC vs. Florida Soccer Soldiers, 7 p.m. ET, Buccaneer Field, Miami Shores, Fla.
Little Rock Rangers vs. NTX Rayados, 8 p.m. ET, Episcopal Collegiate School, Little Rock, Ark.